Summer is on the horizon and area homeowners want to be prepared. It’s no wonder a sellout crowd of more than 40 attendees convened for our latest home maintenance workshop. 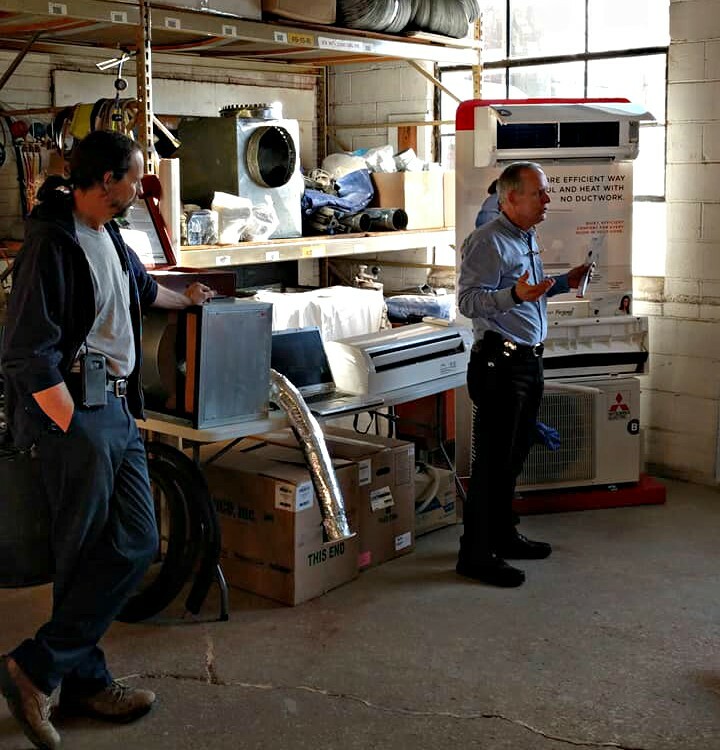 Led by our friend Dave Slife of Slife Heating & Cooling, “Knowing Your Home: Air Conditioning (for Steam Heated Homes)” on April 19 highlighted ductless options for achieving an air conditioned home. For homes with a steam or hot water heating system, it is indeed still possible to enjoy the comforts of modern air conditioning. Dave Slife and his colleague played it cool during their insightful presentation regarding air conditioning. A cooling contractor can start by evaluating your home with a heat-gain calculation in order to determine how much heat gain your home is subject to and what size air conditioning unit your home requires. This evaluation can be influenced by a variety of factors, including placement of doors and windows, the amount of wall and attic insulation your home has, and your home’s orientation with regards to the sun. Ductless mini split system air conditioners (mini splits) can provide homeowners a fairly cost-effective way to replace inefficient window units. Whereas traditional central air conditioning systems force cooled air through ducts, ductless systems deliver air directly into different zones of your home. Potential advantages associated with this method of cooling include relatively easy installation, improved indoor air quality and a reduced carbon footprint. Mini splits consist of two primary components: an outdoor compressor/condenser, and an indoor air-handling unit. A conduit, which houses the power cable, refrigerant tubing, suction tubing and a condensate drain, links the outdoor and indoor units. The relative simplicity of a mini-split system makes it a strong option for homes when ductwork isn’t present nor capable of being added easily. A mini split system should be cleaned regularly, particularly if you smoke or if your home has pets. Regardless of the type of cooling method you ultimately select, annual maintenance of your system can reduce the cost of heating and cooling your home by reducing utility bills, prolonging the life of equipment and reducing the chance of a breakdown at inopportune times. By developing a regular maintenance schedule, you’ll enjoy both peace of mind and a cooler, more comfortable home.